Following the discontinuation of the imported Pontiac GTO, General Motors was at it again in 2008 with another Holden rebadged as a Pontiac. This time however, Pontiac targeted the performance sedan market with a Holden Commodore based car known in North America as the Pontiac G8. The G8 was Pontiac’s first rear-wheel-drive full-size sedan since 1986. The G8 had an optional 6.0L V8, and in 2009 a GXP version of the G8 was offered bumping up power output to 415 horsepower from a 6.2L LS3 V8 engine. Sadly the Pontiac G8 model was short lived when GM decided to discontinue Pontiac as a whole. Owners of 6.0L and 6.2L powered 2008 and 2009 Pontiac G8 and G8 GXP sedans shouldn’t feel too discouraged as their cars can benefit from improved performance by installing a Spectre Performance air intake system. In addition to improving performance a Spectre Performance air intake system will add to the look of the engine bay, and provide better engine sound. The Spectre Performance air intake system for 2008 and 2009 Pontiac G8 and G8 GXP models is available with four synthetic air filter color choices to suit personal preferences or color coordinate with other elements under the hood. 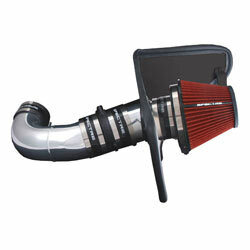 Air intake number 9907 features a red-media air filter, 9907B includes a blue-media air filter, 9907K uses a completely black air filter, and 9907W comes equipped with a white synthetic media air filter. All four Spectre Performance air intake systems for 2008-2009 Pontiac G8 6.0L or 2009 Pontiac G8 GXP 6.2L models are designed to add horsepower and torque without compromising engine protection or drivability. These air intake systems replace factory components with a high quality polished aluminum air intake tube to better direct airflow into the engine. They also include an application specific air filter heat shield, finished in a textured black powder coat, to help deflect hot air from entering the synthetic air filter. Cooler air helps to promote more efficient combustion and more consistent power delivery. These Spectre Performance Pontiac G8 air intake systems include all necessary components and can be installed using basic hand tools for a quick bolt on performance upgrade without breaking the bank. Color choices for the Spectre Performance 2008 and 2009 Pontiac G8 6.0L or 6.2L air intake system comes in the form of a Spectre High Performance Racing (HPR) universal cone air filter. 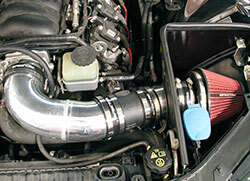 The HPR air filters used in these kits are designed for high airflow while providing necessary engine protection. A Spectre HPR performance air filter is manufactured using high quality materials throughout, including a pre-dyed synthetic filter media that will not fade, top quality urethane, and steel mesh. 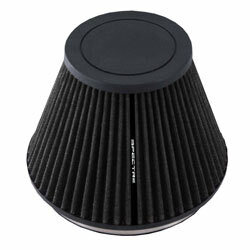 Spectre High Performance Racing air filters are pre-oiled and ready to use. These air filters can be serviced when dirty, using part number 884820, and used again. Owners of 2008-2009 Pontiac G8 6.0L V8 and 2009 Pontiac G8 GXP 6.2L models can rest assured knowing that Spectre Performance warrants its Pontiac G8 air intake systems to be free from workmanship and material defects with a limited 90 day warranty. Since 1983 Spectre Performance has designed and offered unique, innovative, parts and components to fuel your car or truck obsession. Whether your fixation happens to be a classic muscle car or modern performance sedan, Spectre will help fuel your passion for performance. Please use the vehicle search tool to find additional parts for your Pontiac G8 or other vehicle. If assistance is required please feel free to call Spectre Performance at 909-673-9800. Spectre Performance products can be purchased through an authorized dealer near you, or on SpectrePerformance.com.